Marketing is one of the more difficult tasks we face as creatives. Making contacts and establishing relationships can be intimidating. Luckily, we have just the program for you! 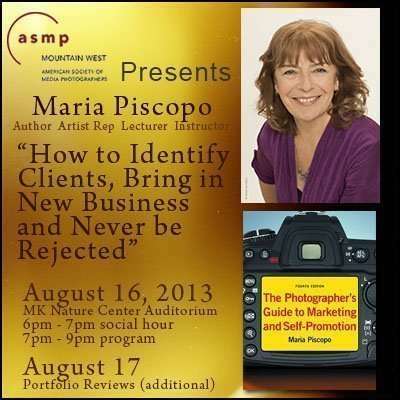 Join us for a presentation on Friday evening and portfolio reviews on Saturday by artist rep, author, lecturer, and instructor Maria Piscopo. Based on her recent book, 4th edition, The Photographer’s Guide to Marketing & Self-Promotion, this program has been updated for today’s commercial photography client. Maria’s new marketplace overview will give you the information you need to find and keep clients. Her techniques are specific, efficient and cost-effective for every area of photography. Topics include: identifying your direction and updating your marketing message, improving responses to your ad and direct mail, email and web marketing tips and techniques, reducing rejection when calling clients, dealing better with voice mail, “no-fail” selling scripts, planning different presentations to get your work in the door and using new follow-up techniques to give you an unbeatable edge over your competition. Even experienced professionals will get new ideas! Maria Piscopo (www.mpiscopo.com) is the author of the 4th edition Photographer’s Guide to Marketing and Self-Promotion and Graphic Designer’s and Illustrator’s Guide to Marketing and Promotion â€” both published by Allworth Press â€” and she has been an art/photo rep for twenty five years. She writes magazine articles for industry publications such as Shutterbug Magazine and Communication Arts and teaches marketing classes at Academy of Art University in San Francisco. Maria’s topics have been successfully presented to industry associations such as AIGA, ASMP, APA, ICON, CAPIC and PPA. Private portfolio reviews with Maria are available on Saturday, August 17, for a separate fee of $150. Friday, August 16, we will begin at 6pm with a social and networking hour at the MK Nature Center Auditorium. The program begins at 7pm. Refreshments and door prizes. 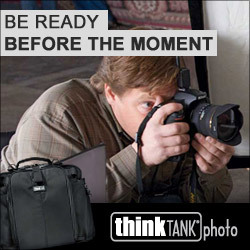 Saturday, August 17, portfolio reviews are scheduled in 30-minute sessions from 8am – 6pm.